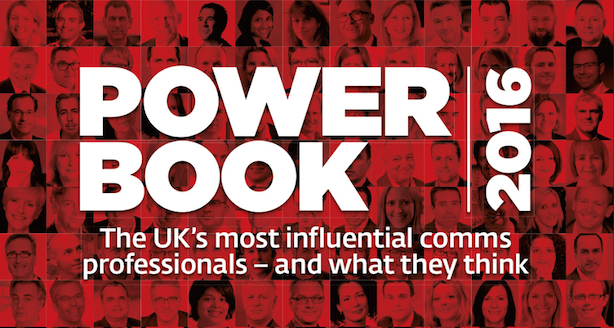 PRWeek UK's annual compilation of the UK's most influential comms professionals has been published. The list includes more than 350 names from the worlds of agency and in-house PR, including PRWeek's analysis of who are the UK's most powerful PR players in the consumer and brand, sport and entertainment, corporate and City and public, politics and charity sectors. The directory is published in full online and in the new December/January issue of PRWeek, which lands on subscribers' desks this week. Power Book entrants were asked to participate in a survey that asked them what had been their favourite PR campaign of the past year, which businessman or woman they thought had the best comms prowess, how the industry should tackle the gender pay gap and more – including what jargon they would ban from the PR lexicon. Stay tuned to PRWeek.com over the next week where we will be publishing the results of the surveys and revealing the top 10 comms professionals in each sector.